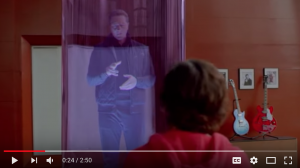 TeleHuman2: Hologrammatic telepresence without glasses! – ixd! Using a ring of intelligent projectors mounted above and around a retro-reflective, human-size cylindrical pod, Dr. Vertegaal’s team has been able to project humans and objects as light fields. Objects appear in 3D as if inside the pod, and can be walked around and viewed from all sides simultaneously by multiple users – much like Star Trek’s famed, fictional ‘Holodeck’. Capturing the remote 3D image with an array of depth cameras, TeleHuman 2 “teleports” live, 3D images of a human from one place to another – a feat that is set to revolutionize human telepresence. Because the display projects a light field with many images – one for every degree of angle – users need not wear a headset or 3D glasses to experience each other in augmented reality. Please include a photo credit to Human Media Lab. A YouTube video is available here. 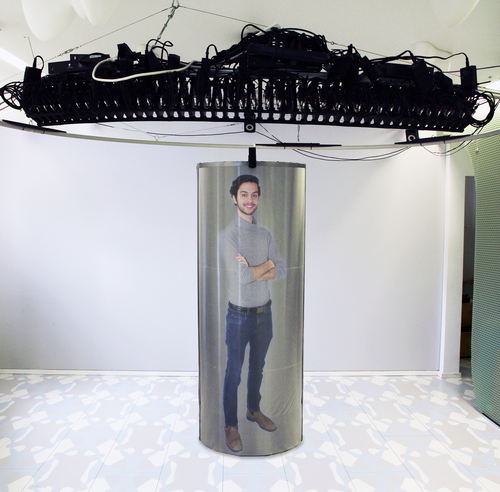 TeleHuman 2 – the world’s first truly holographic videoconferencing system. TeleHuman 2 allows people in different locations to appear before one another life size and in 3D – as if they were in the same room. This work was presented at the CHI2018 conference in Montreal, Canada. Gotsch, D., Zhang, X., Merritt, T., and Vertegaal, R. TeleHuman 2.0: A Cylindrical Light Field Teleconferencing System for Life-size 3D Human Telepresence. In Proceedings of CHI’18 Conference on Human Factors in Computing Systems. ACM Press, 2018.